I love the holidays with all the wonderful food and especially the fresh cranberries. 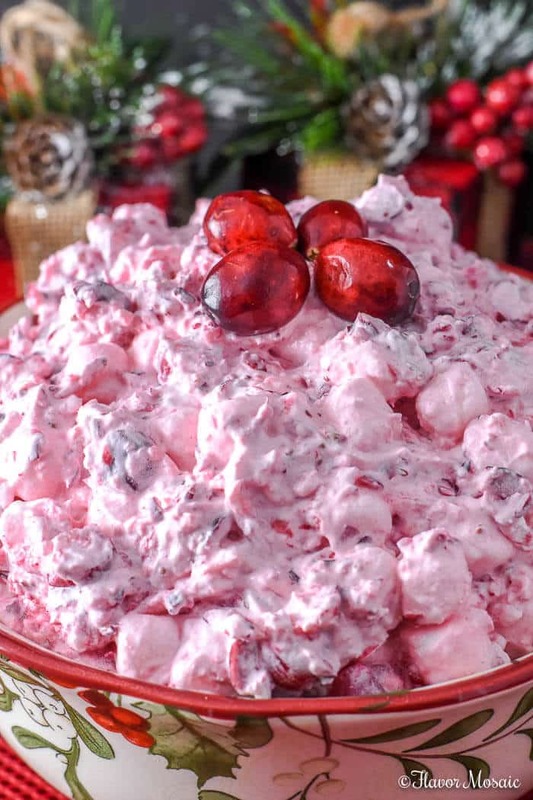 For our Thanksgiving and Christmas dinners, cranberry sauce, Cranberry Christmas Cake, and this Cranberry Fluff Cranberry salad made with fresh cranberries, marshmallows, pineapple, pecans, and whipped topping are always expected. I would not dare show up for a holiday dinner without these delicious cranberry dishes. They call this Cranberry Fluff a salad. However, to me, since it is made with Cranberries, Marshmallows, Pineapple, and whipped topping, it really is a dessert. When my niece and nephew were little, at holiday dinners when they were told to at least try some salad, this was the salad they would choose! Of course, their Mom intended that they eat a green salad. So I teasingly suggested they try the Watergate Salad because it was green! Then their Mom gave me a dirty look because the Watergate Salad is a Pastichio Fluff salad. Hey, what are families for but to tease each other? 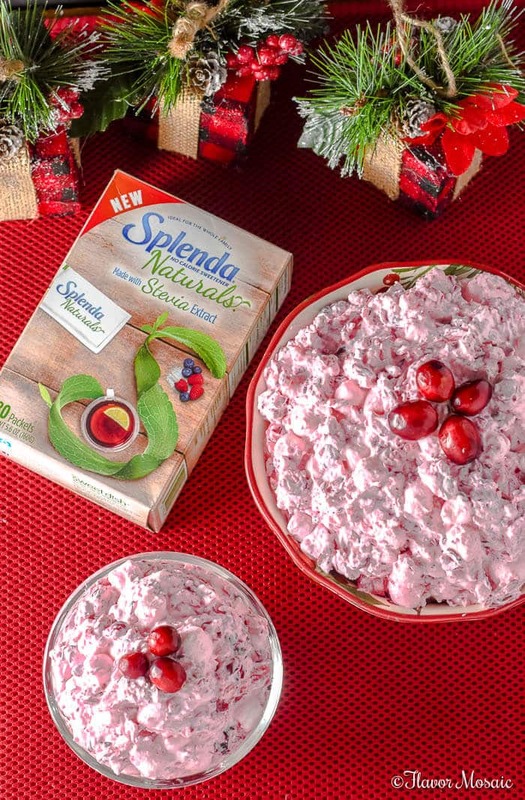 However, their Mom would be proud of me this year because I lightened up the Cranberry Fluff salad by using SPLENDA® Naturals Stevia Sweetener instead of sugar. SPLENDA® Naturals Stevia Sweetener is a no-calorie natural sweetener made with a special stevia extract called Reb D, which has no bitter aftertaste. SPLENDA® Naturals is made with 2 non-GMO ingredients: stevia leaf extract and erythritol, and no added flavors or colors, no preservatives, and only non-GMO ingredients made by minimal and common processes. 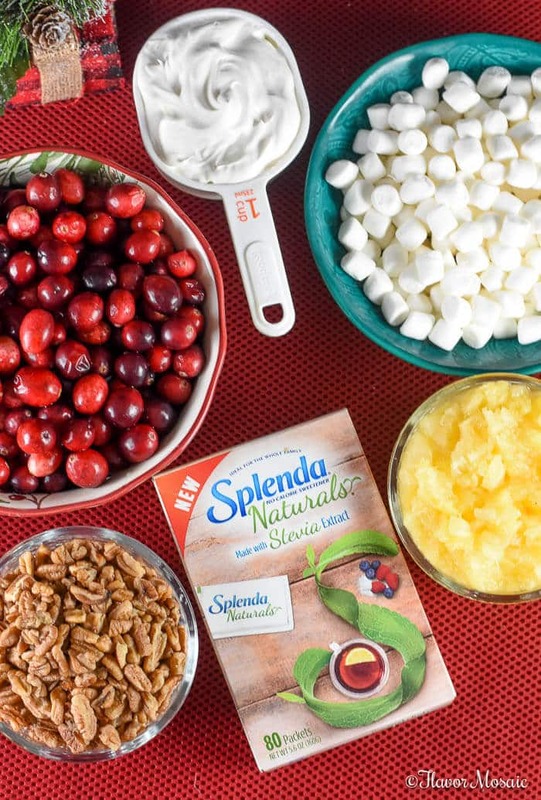 For more recipe ideas check out the SPLENDA® Naturals website. 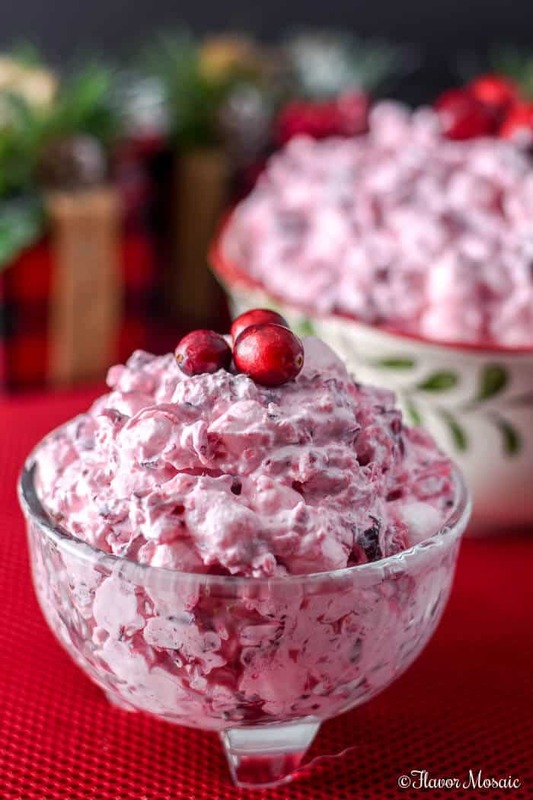 To make this Cranberry Fluff Salad you will to chop the cranberries using a food processor. Then sprinkle them with SPLENDA® Naturals Stevia Sweetener, and cover and refrigerate overnight. Then just add the pineapple, marshmallows, whipped topping, and pecans. Stir the Cranberry Fluff Salad until everything is well combined. Then refrigerate for several hours or overnight. This is a great dish to make for the holidays because you can make it in advance a day or two before Thanksgiving and refrigerate it, and it will be perfect when it is time for your holiday dinner. 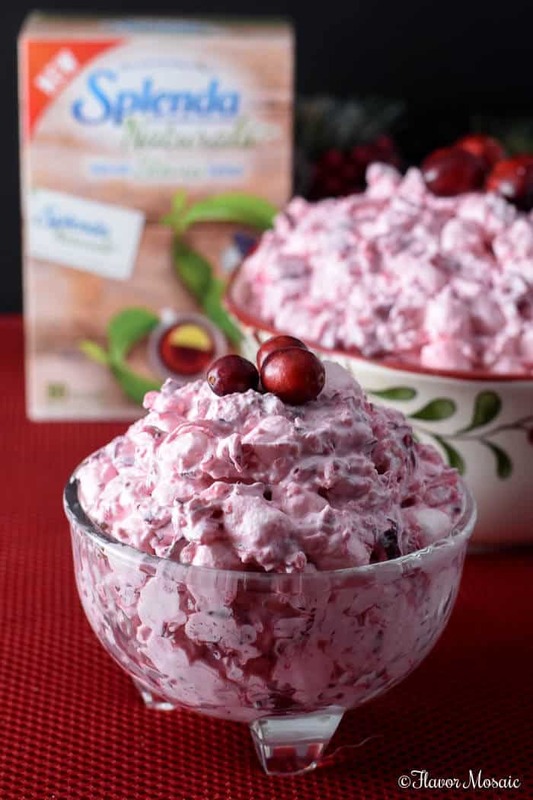 If you love cranberries like we love cranberries, then you need to make this Cranberry Fluff. You may also want to check out our other cranberry recipes, including not only sweet dishes, but savory recipes as well, such as Cranberry Pork, and my Apple Walnut Cranberry Salad. 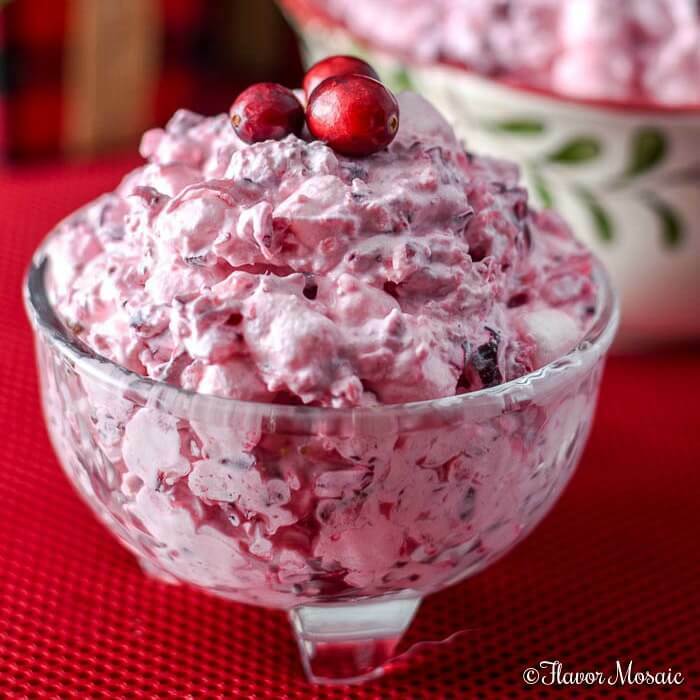 It is your turn to make this easy Cranberry Fluff. Give it a try. Come back and let me know how your family liked it. 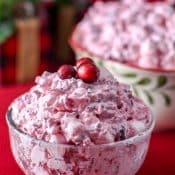 This pretty Cranberry Fluff Salad, made with fresh cranberries, makes a sweet and delicious salad, side dish, or dessert for a Thanksgiving or Christmas holiday dinner. Dice the cranberries in a food processor. 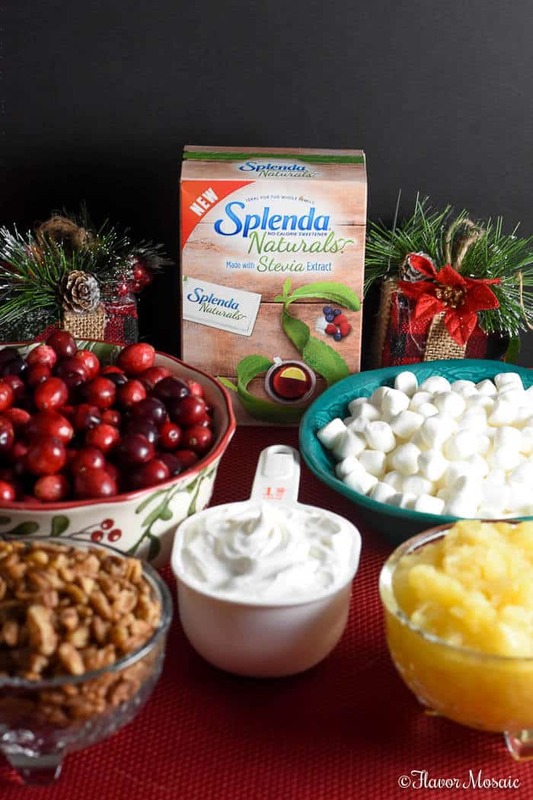 Transfer the cranberries to a bowl and sprinkle with SPLENDA® Naturals Stevia Sweetener. Stir until well combined. Cover and refrigerate the cranberries overnight. Add pineapple and pecans to cranberries and stir. Add small marshmallows and stir. Serve the Cranberry Fluff immediately or cover and refrigerate until ready to serve. So super festive! Looking forward to cranberry season! Thank you Lane and Holly. Love the combination of cranberry, pineapples and pecans! I realize this is not a timely reply but I’m hoping that someone will benefit from it. My grandma always made this recipe but used sliced grapes instead of pineapple. It wasn’t until I went looking for the recipe that I realized it was more commonly made with pineapple. I still use grapes and they’re fantastic. Feel free to substitute those for the pineapple! I love to hear about family recipes. I bet that tastes great with grapes. I may try that some time. Thanks for sharing. Can you make this without leaving the cranberries overnight? I’m planning on making this tomorrow and just saw that it said start the cranberries the night before. Hi Leah, thanks for the question. If you can’t leave the cranberries overnight start them tomorrow as early as you can tomorrow. It is good if the cranberries sit for at least an hour. I hope that helps.